Love Uncontainable, Courage Unfathomable. | The Size of a Mustard Seed. Matthew 17:20. It is impossible to not admire the heroic lives of young saints. At a very early stage in their life they always valiantly swam against the current, showing to everyone that their new life was in Christ. Thus setting the tone to everything they did. Not only did their immense faith set for us an example, but just the simple fact that centuries later we are still drawing inspiration from them is amazing. One need only to think of fact that some of them did not live beyond the tender age of thirteen, and yet held within them more love than the size of their own body, to become amazed by their stories. With this, I would like to introduce St. Agnes. Now she, my friends, had personality. It doesn’t matter that she lived all the way back in the early fourth century – we know that this girl had great spirit within her. She was beautiful, sought after by many. Fell in love with Christ. Dedicated her life to him, giving Him her purity. And she always Carried with her the knowledge of the beauty in her chastity. She was in love and was not afraid to tell it to the world…even though it could get her killed. And indeed they never did. Showcasing her heavenly relationship with Christ she had the courage to bear all for love of Him. When told to offer incense to the roman gods to save her life it is said that she was “by no means be compelled to move her hand, except to make the sign of the cross.” The ruler, utterly baffled, finally gave up in trying to break this young girl’s courage, he sent her to be beheaded. But this little mighty cheerfully one knew that she was not created for this world. SO, long story short, she was EPIC. Don’t believe me? Well, um… Here! Read St. Ambrose’s reflection on her! Oh and uh before that…. Allow me to remind you that she was like twelve or thirteen when she was martyred… Just sayin’. ” Today is the birthday of a virgin; let us imitate her purity. It is the birthday of a martyr; let us offer ourselves in sacrifice. 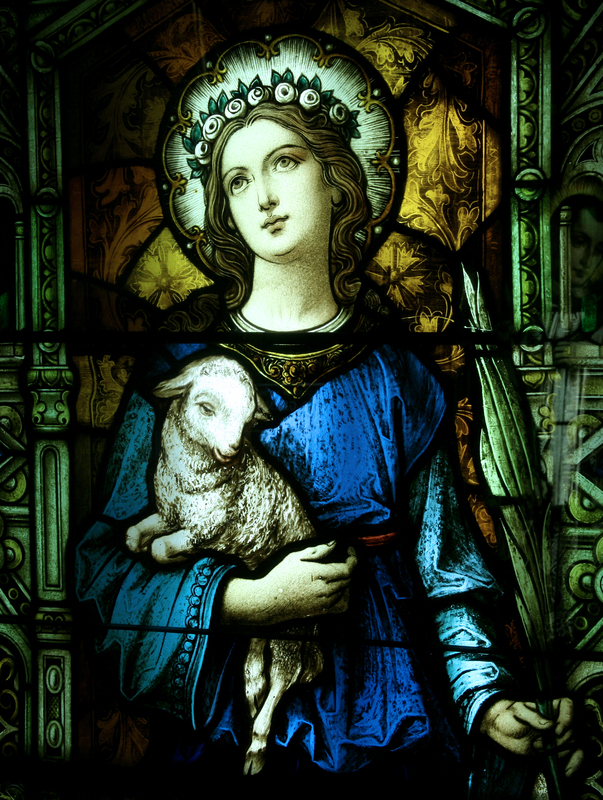 It is the birthday of Saint Agnes, who is said to have suffered martyrdom at the age of twelve. The cruelty that did not spare her youth shows all the more clearly the power of faith in finding one so young to bear it witness. A new kind of martyrdom! Too young to be punished, yet old enough for a martyr’s crown; unfitted for the contest, yet effortless in victory, she shows herself a master in valour despite the handicap of youth. As a bride she would not be hastening to join her husband with the same joy she shows as a virgin on her way to punishment, crowned not with flowers but with holiness of life, adorned not with braided hair but with Christ himself.In the midst of tears, she sheds no tears herself. The crowds marvel at her recklessness in throwing away her life untasted, as if she had already lived life to the full. All are amazed that one not yet of legal age can give her testimony to God. So she succeeds in convincing others of her testimony about God, though her testimony in human affairs could not yet be accepted. What is beyond the power of nature, they argue, must come from its creator. What menaces there were from the executioner, to frighten her; what promises made, to win her over; what influential people desired her in marriage! She answered: “To hope that any other will please me does wrong to my Spouse. I will be his who first chose me for himself. Executioner, why do you delay? If eyes that I do not want can desire this body, then let it perish”. She stood still, she prayed, she offered her neck. Powerful the things that love and faith can do, no? A love so pure it gives oneself fully. A relationship so real one would die for it so to not deny it. And a reward so great that no eye has envisioned, no ear has fathomed, and no mind has ever imagined, what God has planned for those who love Him (1 Corinthians 2:9). « My Childlike Awe for the Saints has Not Gone Away…. Seriously. I Promise.